This spinach artichoke dip is easy, super cheesy, and perfect for your next party. Serve it in a bread bowl or with your favorite chips or crackers. Raise your hand if you love dip. Me too. Meeeeee too. Any and all dips, bring ’em on! If it’s dip, you can bet your bottom dollar I’m going to want to devour it. My husband and I have long been massive fans of spinach artichoke dip. We’ve always ordered it nearly anytime we see it on a menu, anywhere from a bar when we’re watching a sporting event, to nicer restaurants before our main meal. Sometimes crab is thrown in there, sometimes it’s served with tortilla chips, sometimes potato chips or baguette. What can I say? No matter how it’s served, we love the stuff! Which is why I’m so thrilled to share this killer homemade spinach artichoke dip with you! 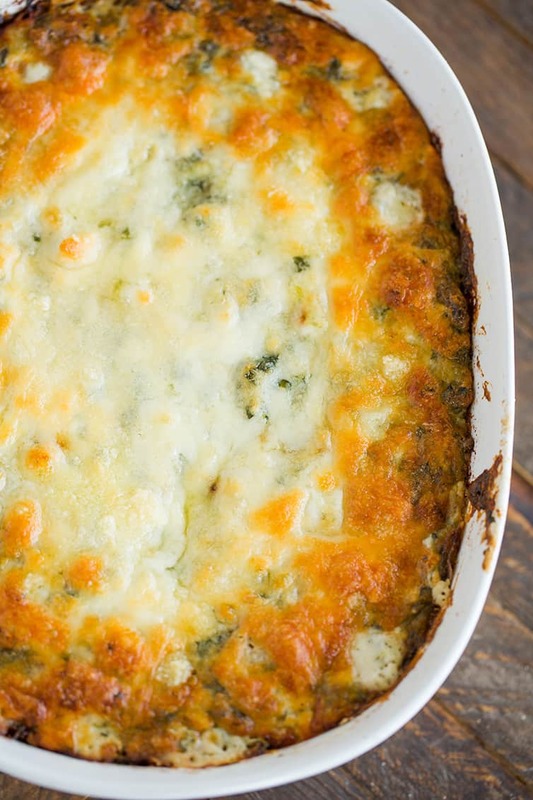 Watch How to Make Spinach Artichoke Dip! As far as appetizers and dips go, the easier the better since most times you’re making them for a crowd and no one wants to be fussing in the kitchen when company arrives, right? Luckily, this spinach artichoke dip could not be easier to make. Prior to this iteration, I had tried some old recipes from my mom’s recipe books that were either really mayonnaise-y or too sour cream-y, or not enough spinach. I tweaked the previous version that was on the site just a smidge to include a little more cream cheese, equal amounts sour cream and mayonnaise, a little milk and cream to keep the dip creamy, and some extra zing with crushed red pepper flakes, salt and pepper (in doing so I omitted the paprika). I think this version has the perfect amount of everything! Mix everything together in one bowl, dump it into a baking dish, pop it into the oven and 30 minutes later you’re ready to dig in! It’s easy, super cheesy, and everyone goes totally bananas for it. You can assemble this dip a day in advance and store it in the refrigerator, covered. I recommend bringing it to room temperature before baking, otherwise plan on a longer bake time. 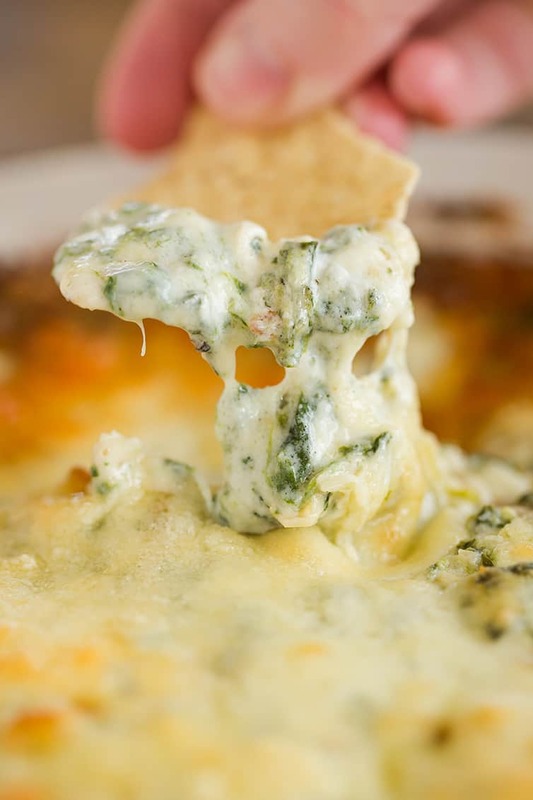 I’ve heard of some people eating cold spinach artichoke dip, which you could technically do, but this one is definitely at its best warm and cheesy! If you want to make it a liiiiiiitle bit healthier and prefer no mayonnaise or sour cream in your dip, you could use Greek yogurt in place of the mayonnaise and sour cream. 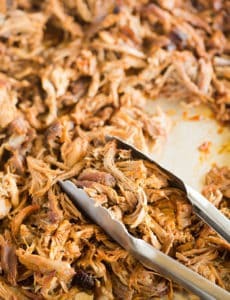 This dip always disappears really quickly, so if you’re making it for a crowd or party, I would recommend doubling the recipe and baking in a 9×13-inch pan or other 3-quart baking dish. I’ve never made this in a crock pot because I love the browned and bubbling cheesiness you get from baking in the oven, but if you’d like to use your slow cooker, I would recommend assembling it just as you would for the oven (including placing the extra Monterey Jack and Parmesan on top) and cook on low for 2 hours. Once done, stir everything together and serve (or switch to the keep warm setting and let guests serve themselves!). Spinach artichoke dip is definitely one of those classics that everyone needs in their recipe arsenal, and I can say, without a doubt, that this is the absolute BEST spinach artichoke dip you’ll ever make! Grab your favorite chip or dipper and dig in! Throwing a Big Party? Add These Other Popular Dips To Your Menu! 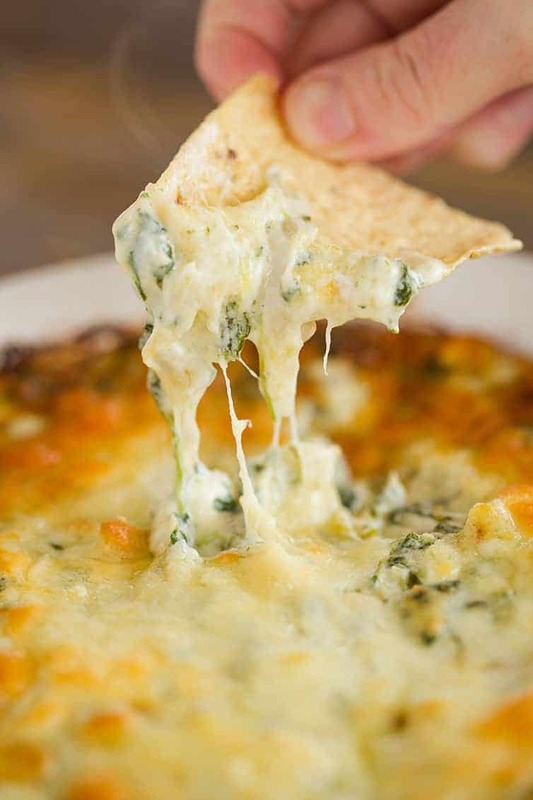 This spinach artichoke dip is easy, super cheesy, and perfect for your next party. Serve it with your favorite chips or crackers. 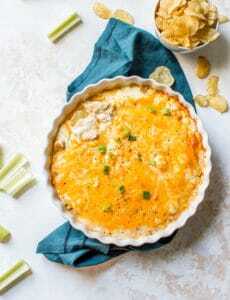 In a large bowl, combine the spinach, chopped artichokes, spinach,1¼ cups of Monterey Jack cheese, 1¼ cups of Parmesan cheese, cream cheese, mayonnaise, sour cream, milk, heavy cream, garlic, red pepper flakes, salt and pepper, and stir well to combine. Spoon the mixture into a 1½-quart baking dish. Sprinkle the remaining ¼ cup Monterey Jack and ¼ cup Parmesan cheeses on top. Bake for 25 to 35 minutes, or until browned and bubbly. Serve warm with tortilla or pita chips, crackers, vegetables, or in a bread bowl. Leftovers can be stored in the refrigerator, covered, for up to 4 days. You can double the recipe and bake in a 9x13-inch dish or other 3-quart baking dish. This recipe was originally published on August 26, 2010. I tried the recipe and it had so much grease floating on the top after baking that I had to spoon it off before serving. The taste was very good but perhaps I should be using low fat cheeses, mayo and sour cream to avoid the abundant grease factor? Oh no, I’ve never had that happen! I always use full-fat ingredients. I make this as a side dish and serve it with a grilled chicken breast and jasmine rice for dinner! It tastes really great coupled with the rice and chicken! Absolutely love the way this looks. I’ve been looking for a great artichoke dip recipe but haven’t really found the right one yet. I am definitely giving this one a try! Thanks so much for sharing. Ooooh, I love paprika though! Would you substitute it equally for the pepper flakes, which I don’t love? Hi Kate, Yes, I think anywhere from 1/2 to 1 teaspoon would be good! 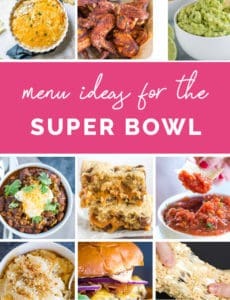 I’m definitely going to make this Crockpot style for a work Super Bowl party. How much does using Greek yogurt change the consistency/taste? Lots of healthy people in our office and I’d love a lower calorie option. Thank you. Hi Lisa, Consistency is about the same, but the flavor will be less rich than if you use the sour cream/mayonnaise. This is my all time favorite Brown Eyed Baker Recipe and the recipe that I have used most often. It is easy to make ahead and is a crowd pleaser everytime it is served. The aroma welcomes all to our home when they enter. Thanks for your posts and recipes. Love the pictures of your children and your food! Great recipe. I added some chopped water chestnuts to add a bit of texture. Superb! This looks so very good! I can’t wait to try the recipe! My favorite restaurant in our little town has the best Spinach Artichoke Dip, and they serve it with “pita points” (little triangular pieces of pita bread). I love reading your blog and seeing your precious little boys as they grow and change! My babies are grown and now I am loving on my 2 grandchildren! Keep up the good work! Thanks for the recipe! I made it this morning for a Christmas office party and it turned out very well. The only thing that I would personally change is the sodium level. It was a bit too salty for me. Other than that, it tasted great! The search is finally over thanks to our Brown Eyed Baker! This dip was wonderful .. Many thanks for contributing to the success of a wonderful cocktail party I recently gave. Not Only was it delicious , flavorful, creamy, etc….but it was sooooo pretty and golden bubbly … Made an : owwwww …. What’s THAaaT appearance on my table. No more searching for the “perfect” spinach artichoke recipe , that’s to my BEB! HAPPY HOLIDAYS MICHELLE AND EVERYONE! There was a restaurant in the town where I went to college that had the most delicious Spinach and Artichoke dip I have ever had. My mom and I loved that dip so much that we only ever ate at that one restaurant when my parents visited! I’ll be making this as soon as I next go home. P.S. Welcome to Pittsburgh! I hope you’re enjoying it! I read over this, but I just CAN’T do mayo. Is there a substatute for this? It depends on what else you like. Perhaps sour cream, yogurt, etc.? 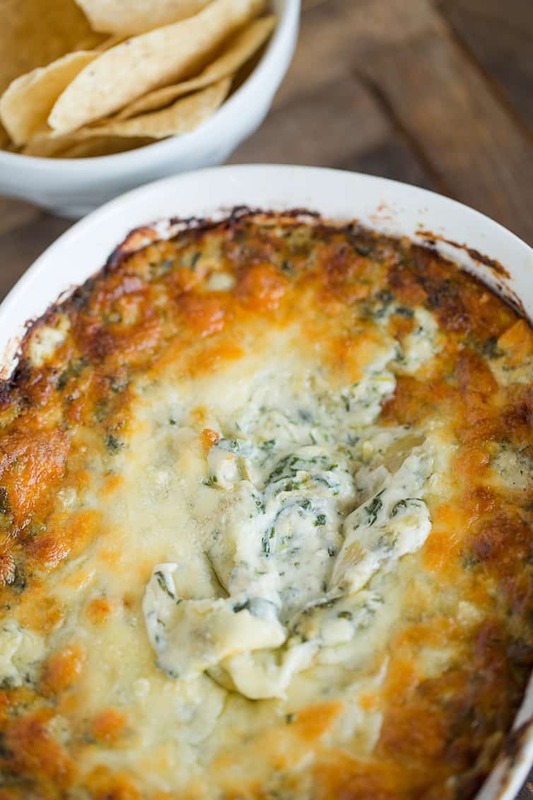 I am a huge fan of spinach and artichoke dip and look forward to testing this recipe out. I have been making one of my own for the past 5 years that knocks a crowds socks off. I would love for you to try it out and tell me what you think. I can’t honestly remember where I got this recipe from but I can guarantee it’s a winner. I highly recommend preparing all of the ingredients prior to making the dip, it can be very time consuming. 2. Stir in flour and cook for 1 minute, whisking throughout. 3. Slowly whisk in heavy cream and chicken broth and continue to cook until boiling. 4. Once boiling, stir in Pecorino Romano, lemon juice, hot sauce, and salt; stir until cheese has melted; once melted remove from heat. 6. Fold in spinach, artichoke, and *lump crab meat. 7. Place dip in serving dish and sprinkle evenly with cheddar cheese and tomato. This dips works great with a salty chip that’s strong enough to uphold a heavy dip. The dip can be refrigerated until ready to serve, if desired. The crab meat is a must for my friends and family, I’d love for you to test it out. I look forward to making your version for my family and friends as well. So far your cupcake recipes have been a huge hit with my family. Thank you for all of the wonderful recipes. Hi Leitisha, Thank you so much for sharing! It sounds delicious! What about oven time? None? I really want to try this. Can I use fresh spinach instead of the frozen one? It’s not readily available where I live. I just made your spinach artichoke dip and it was amazing. My parents are visiting for the weekend and I was so happy to impress them with this wonderful snack. Thanks so much for sharing!